Among the many pleasures of life in Canberra is the ongoing program of concerts at the Wesley Music Centre in Forrest. Its pleasant, leafy setting is within walking distance of the Kingston Markets and Foreshore and the shops and restaurants of Manuka. Virtually every week there are three or four short concerts which attract a committed and discerning audience of Canberra locals and visitors. Most of the concerts feature the impressive roster of local artists – another of Canberra’s unsung pleasures: its musicians! – with the occasional incursions of visitors. 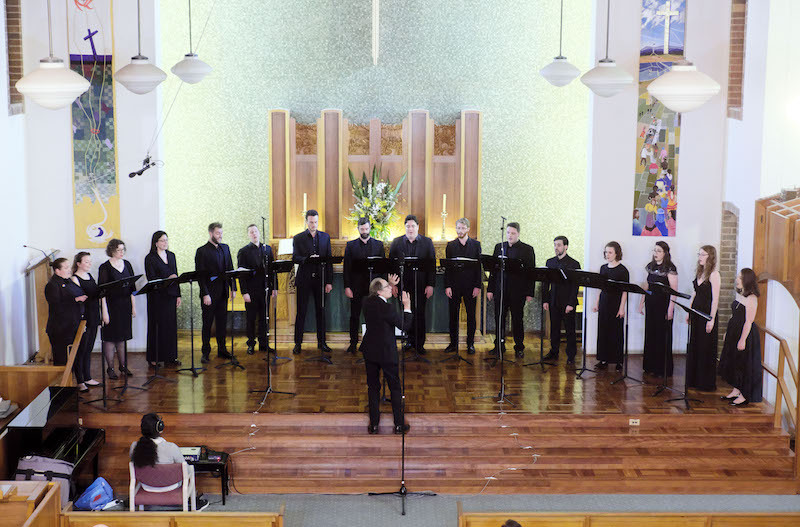 Such was the case this past weekend when two young chamber choirs – the chamber singers of the local choir Luminescence hosting the visiting Consort of Melbourne – combined to perform a rarely heard work by Frank Martin, his Mass for Double Choir. The Swiss-born composer, but Dutch-based Frank Martin (1890-1974) is known to us in Australia by only a handful of works today, notably the Petite symphonie concertante Op.54 (1946) for harp, piano, harpsichord and strings. This was a commission from that great conducting philanthropist Paul Sacher whose Collegium Musicum of Zurich included the work in their Adelaide Festival programs in 1974. (Around the same time, a performance by members of the Sydney Symphony Orchestra conducted by Willem van Otterloo appeared on an EMI LP.) More recently, Charles Dutoit conducted Martin’s Concerto for Seven Winds with the Sydney Symphony Orchestra in July 2013. There is also some deal of chamber and vocal/choral music, little of which I can claim to have heard. This past weekend’s performance of Martin’s Mass for Double Choir was a major addition to my slim personal repertoire of music by this composer. At around 30 minutes, it follows the five movements of the Latin Mass succinctly and snugly and is scored for eight fairly equal choral lines. In the choral textures of this Mass one can easily recognise Martin as the son of a Calvinist preacher – clear, strong counterpoint and solid block textures we associate with Hindemith and the older members of the Andriessen family. This music only very occasionally approaches ecstatic heights. Martin’sMassmust be a very gratifying work to sing, just as it would provide assurance and comfort to its audience, either in a liturgical or concert setting. With his 25-plus years as director of The Song Company, Roland Peelman has an extraordinary capacity to draw fine singing from young(ish) singers. But in this instance not too much so. For the most part, he managed to constrain the natural exuberance of many of the 16 singers grouped in a semi-circle before him. There may not have been much time for combined rehearsal, but this remarkably self-assured performance showed no sign of last-minute, seat-of-the-pants preparation. It was, at times, quite moving, even thrilling. For some, there was even greater interest in the four short works by young(ish) Australian composers which were interleaved between the movements of Martin’s Mass. These were commissioned by the host group, the Luminescence Chamber Sings with financial assistance from ArtsACT, and were intended to illustrate the composers’ responses to Martin’s opus. Each new work, lasting less than five minutes, the skimpy and anonymous program notes revealed, “draws upon a different set of religious and cultural traditions and texts, creating a musical dialogue between a diverse range of musical expressions of spirituality”. In his setting of Psalm 137 (“By the rivers of Babylon”), Kim Cunio, now on staff at the ANU School of Music, drew on memories of the cantillations he heard as a child at a Sephardi synagogue in Iraq. His textures ebbed and flowed, like waves lapping gently onto a shore of unison pitches. Brad Gill’s Drop off the body took its text from poems of Chinese Buddhist nuns. The music emerged as constrained, even quite formalistic, resisting any overt attempt at Orientalism. The eight-voice Russian Orthodox setting of Psalm 22 (“The Lord is My Shepherd”) by Anastasia Pahos was cast in more familiar guise. It unfurled beautiful evocations, especially from high sopranos, of more conventional Byzantine repertoire. These provided a comforting, ear-cleansing foil to the astringency of some of the other pieces. This was especially so with the fourth new work, Baptism by Fire, by Elliott Gyger. Now 50 years of age, Gyger has had a distinguished career at Harvard and is today a leading member of the composition faculty at the University of Melbourne. This was the most developed and abstruse of the four new works, drawing upon literary exchanges, real and imagined, which suggested not only the acclamations in Hebrew and Greek of the Seraphim, but also the vocal gymnastics of the likes of Luciano Berio. It provided a bristling and at times disorienting experience, drawing us some distance from the comfort zone of Frank Martin’s euphony. A pity that the program notes contained no information about the Australian composers and that only one, Kim Cunio, was able to be present. Overall, the experience of these four quite different compositions caused me to recall an observation made by Peter Maxwell Davies in Adelaide a half-century ago. Paraphrasing him after all these years, Max cautioned young composers who are given the prize of writing for a professional chorus. Don’t over-cook or over-write for these wonderful voices, he warned. Use some silence, thin out the choral textures. There was not nearly enough of that in these works. Perhaps they might have listened to some of the choral settings of Arvo Pärt or Ross Edwards. All that aside, it was refreshing to hear such assured performances of some knotty and gritty music from these fine young choristers. Bravo to both groups for the enterprise and to Roland Peelman, ever the Good Citizen of the Republic of Music, for conceiving such an adventurous and rewarding exercise of music spread across the decades and across faiths and beliefs. Like the best festival programmes, this is one to provoke debate and disagreement. The Festival hits the ground running with music from home and abroad. In the wake of Brexit and Trump, Artistic Director Roland Peelman explores social upheaval across history at the 2017 Festival. One hundred years after Russia’s revolutions, massive upheaval will theme the 2017 Canberra International Music Festival.